weaselsnake: Who thought this made sense? Who thought this made sense? both) of these signs up together and think "Yeah, this makes sense. quotations marks for "emphasis." Then my head might have exploded. Pseudonym: It makes a weird sort of sense, I think, down THIS way then to the right, vs. Down to the right, this way. Do I think the signage is dumb, yes, but you can see just what happened: Some clown put up a sign that is extremely clear (but completely inaccurate) and some Deputy Clown tried to fix it by addendum. The 2nd sign makes the whole situation just the opposite, accurate, but very unclear. 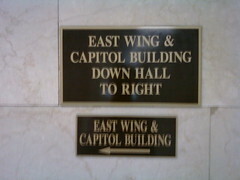 Even without the written hints, I could guess this was a governmental building.